ACTUAL BRIGHT LIGHT - Over 1,000 Lumen Super bright Flood Light. 10 Watts of LED floodlight power. Ability to brighten up a driveway, backyard. Works great as a security light. Use around the house or business for security. 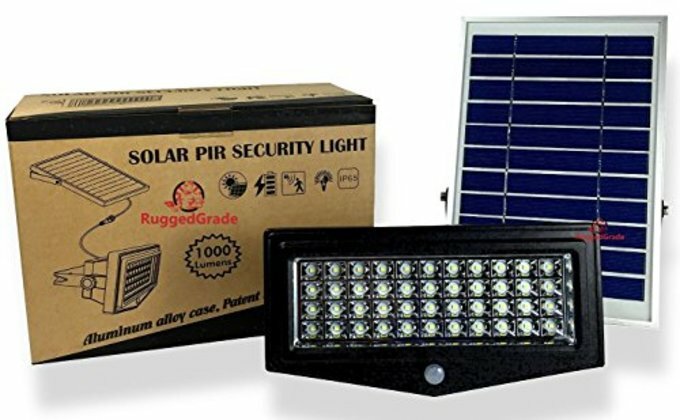 EASY INSTALLATION AND ADJUSTABLE - Easily install the flood light and solar panel anywhere in minutes, no need to hire an electrician. Direct mount onto wall or other surface. Solar Panel and LED are mounted separate to get the correct angle. Adjust the angle as needed to position the light. Includes 3.5 meter cable. LONG LIFE BATTERY - Premium super-size 8000mah battery has the power to stay on longer and run for years and years. Lithium Ion Battery for best performance. Battery can be changed without replacing unit. QUALITY AND WARRANTY - CE and ROHS certified. High quality Aluminum and Hard plastic construction. IP65 Outdoor waterproof.